This storywas updated at 6:22 p.m. EST. The massive8.8 earthquake that struck Chile may have changed the entire Earth's rotationand shortened the length of days on our planet, a NASA scientist said Monday. The quake,the seventhstrongest earthquake in recorded history, hit Chile Saturday and shouldhave shortened the length of an Earth day by 1.26 microseconds, according toresearch scientist Richard Gross at NASA's Jet Propulsion Laboratory inPasadena, Calif. One microsecond is one-millionth of a secondlong. “Thischange should be permanent,” Gross told SPACE.com today. There is a chance theEarth’s rotation could relax over time, but it is too early to tell, hesaid. The computermodel used by Gross and his colleagues to determine the effects of the Chileearthquake effect also found that it should have moved Earth's figure axisby about 3 inches (8 cm or 27 milliarcseconds). "Perhapsmore impressive is how much the quake shifted Earth's axis," NASAofficials said in a Monday update. 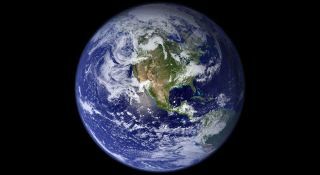 The Earth'sfigure axis is not the same as its north-south axis, which it spins around onceevery day at a speed of about 1,000 mph (1,604 kph). The figureaxis is the axis around which the Earth's mass is balanced. It is offset fromthe Earth's north-south axis by about 33 feet (10 meters). Strongearthquakes have altered Earth's days and its axis in the past. The 9.1Sumatran earthquakein 2004, which set off a deadly tsunami, should have shortened Earth's days by6.8 microseconds and shifted its axis by about 2.76 inches (7 cm, or 2.32 milliarcseconds). OneEarth day is about 24 hours, or 86,400 seconds, long. Over the course of a year, the lengthof a day normally changes gradually by about one millisecond, which is 1,000 microseconds. Thatvariation is due to seasonal variations in the Earth’s ocean currents andthe atmosphere’s jet stream, Gross said. As the jet streamshifts southward during the winter months in the Earth’s northernhemisphere, the length of the day gradually changes, he said. Inthe past, Gross has said that Earth’s rotation slows down slightly inthose winter months, then picks back up in the summer. The Chileearthquake was much smaller than the Sumatran temblor, but its effects on theEarth still have an impact because of its location. Its epicenter was locatedin the Earth's mid-latitudes rather than near the equator like the Sumatranevent. Grosscompared the Sumatran event to a figure skater drawing her arms inward duringa spin to turn faster on the ice. Since the Sumatran quake was closer to the Earth’sequator, its day-shortening effect is stronger than the Chile temblor, he said. But the faultresponsible for the 2010 Chile quake also slices through Earth at a steeperangle than the Sumatran quake's fault, NASA scientists said. "Thismakes the Chile fault more effective in moving Earth's mass vertically andhence more effective in shifting Earth's figure axis," NASA officials said. Gross saidhis findings are based on early data available on the Chile earthquake. He isconfident in the computer model’s accuracy, with only slight tweaks expectedto be required, he said. The Chileearthquake has killed more than 700 people and caused widespread devastation inthe South American country. Severalmajor telescopes in Chile's Atacama Desert have escapeddamage, according to the European Southern Observatory managing them. Asalt-measuring NASA satellite instrument destined to be installed on anArgentinean satellite was also undamaged in the earthquake, JPL officials said. The Aquariusinstrument was in the city of Bariloche,Argentina, where it is being installed in the Satelite de AplicacionesCientificas(SAC-D) satellite. The satellite integration facility is about 365 miles (588km) from the Chile quake's epicenter. The Aquariusinstrument is designed to provide monthly global maps of the ocean's saltconcentration in order to track current circulation and its role in climatechange.